This self-portrait shows Charles Willson Peale in his Philadelphia Museum. Born in Maryland, the painter moved to Philadelphia in 1775 to reach a wider audience of clients. His museum was an offshoot of his painting activities during the Revolutionary War, during which he painted portraits of some of the most famous figures of the Revolution. When the museum opened in 1784 he had a collection of forty-four portraits of “worthy personages” of the American Revolution. During its existence the museum moved from the American Philosophical Society to the recently abandoned Pennsylvania State House (later known as Independence Hall). 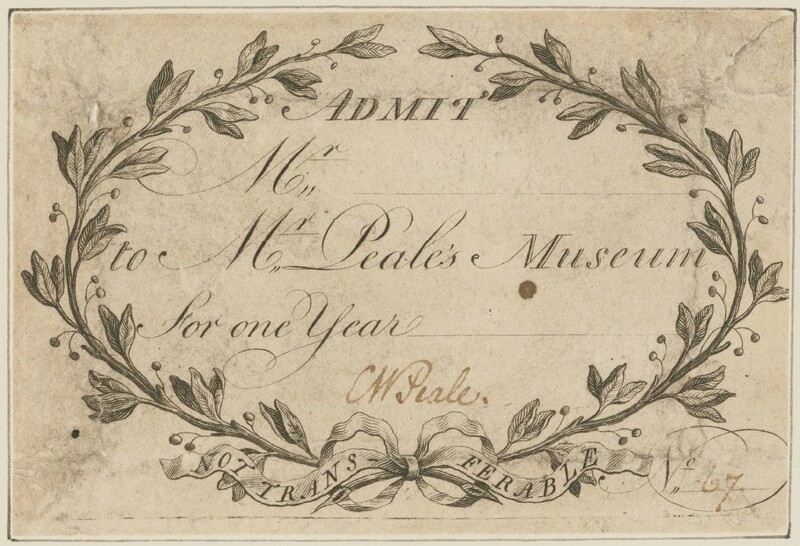 This ticket admitted the bearer to the museum Peale created in his home at Third and Lombard Streets. 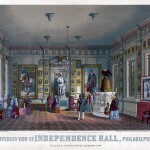 In the 1790s, Peale moved his family and collections to Philosophical Hall and later expanded into the second floor of the Pennsylvania State House (Independence Hall). Peale envisioned his museums as places where visitors could become informed and educated about the world around them. One of the attractions of Peale's Museum, the physiognotrace, allowed silhouettes to be traced and then cut from paper to create a souvenir. 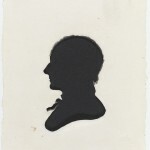 Moses Williams, an African American, was employed to make silhouettes like this one of Charles Willson Peale. After Peale's Museum closed and his portraits went to auction in 1854, the largest purchaser was the City of Philadelphia. The city's purchases can be seen in this 1855 view of the east room of the first floor of Independence Hall. The portraits, in gold matting, flank the statue of George Washington and are hung between and above the windows. In the twenty-first century, Independence National Historical Park displayed portraits by Peale in a gallery in the Second Bank of the United States just as the artist had hung them in his museum: aligned with the ceiling. Inspired by eighteenth-century Enlightenment ideals celebrating humankind’s capacity to learn and use new information, the artist Charles Willson Peale (1741-1827) conceived his Philadelphia Museum. In it, Peale intended the works of man and nature to coexist for the edification of all. The Philadelphia Museum, Peale said, served “to instruct the mind and sow the seeds of Virtue” in the new, American republic. 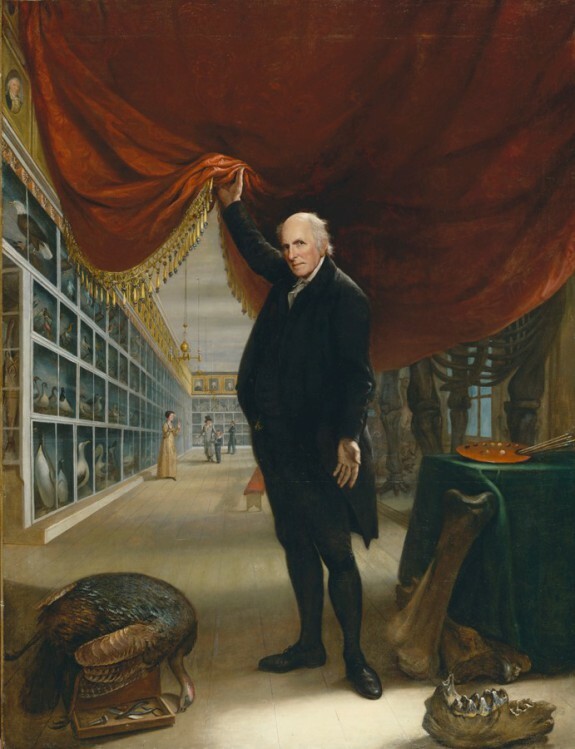 For nearly fifty years, Peale and his family filled the museum with hundreds of painted portraits, thousands of natural history specimens, minerals, models, Asian and American Indian artifacts, archaeological objects, life-size wax figures, fossils, and curiosities—all exhibited to an international public. Peale developed his museum as an offshoot of his portrait-painting business. Drawn to Philadelphia by the large city’s client potential, Peale arrived in 1775 and quickly secured private portrait commissions. Seeking to market his painterly skill, Peale displayed the portraits of Revolutionary War officers in his home at Third and Lombard Streets. The display’s popularity suggested a business opportunity in the form of a pay-for-admission exhibit. Encouraged by family and friends, Peale formally announced the opening of the Philadelphia Museum in 1784 with a display of forty-four portraits that depicted “worthy personages” of America’s Revolutionary era. Peale’s Philadelphia Museum grew quickly. To accommodate the Museum’s expansion, Peale moved it and his family in 1794 to the American Philosophical Society (America’s first scientific society) at Fifth and Chestnut Streets. 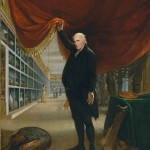 There, Peale served as librarian while he increased his own museum collection of natural history specimens and paintings. The museum also had a large, live menagerie that included among its inhabitants two grizzly bears, a monkey, and an American bald eagle. Peale spent much of the 1790s studying, preparing, and installing natural history specimens in new exhibits. Always looking to strengthen the museum’s financial footing, Peale regularly petitioned both state and federal governments for endorsements. Not even fellow naturalist President Thomas Jefferson (1743-1826) escaped Peale’s museum marketing. Although Peale never received a monetary subsidy, he secured a high public profile for the museum when the state of Pennsylvania loaned its former State House, now called Independence Hall, to him in 1802. Pennsylvania’s State House, where the Declaration of Independence and the U.S. Constitution were created, provided the Philadelphia Museum with an illustrious historic setting that added weight to Peale’s didactic mission. On the second floor of the Pennsylvania State House, the Philadelphia Museum reached its zenith. Museum visitors received a printed catalog with which to organize their study of the exhibits. Peale and his sons arranged the collections according to the classification system developed by Swedish botanist Carl Linnaeus (1707-78). Each exhibit included a painted backdrop that simulated the habitat of the specimen(s) displayed therein—a novel technique at the time. By 1811, the museum featured a Quadruped Room, a Marine Room, and a Mammoth Room that displayed the reassembled, nearly complete skeleton of a mastodon excavated by Peale in New York state. The painted portraits of famous Americans and Europeans hung in the museum’s Long Room above glass cases holding birds, reptiles, insects, minerals, and fossils. Supplied with specimens by government-sponsored scientific expeditions like those of Meriwether Lewis (1774-1809) and William Clark (1770-1838) and Stephen H. Long (1784-1864)—from which Peale’s son, Titian (1799-1885), returned with a vast butterfly collection—the Philadelphia Museum also included American Indian clothing, weapons, and household objects. Charles Willson Peale’s son, Franklin (1795-1870), would later bring to the Museum objects from voyages to Hawaii, the Fiji Islands, and South America. Throughout the museum’s existence, citizens donated historical relics, like the thimble of Martha Washington (1731-1802), for inclusion in its displays. Mindful that exhibits were not enough to insure repeat museum visitation, Peale also provided “rational amusements” to his patrons. Scientific lectures, technical demonstrations (including a static electric machine), and musical entertainment took place in the museum’s lecture hall. 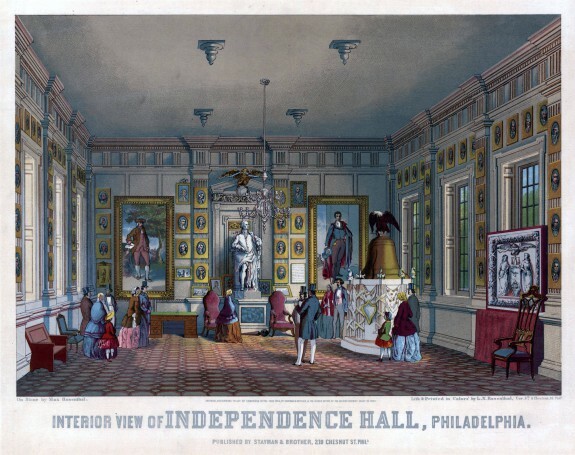 The Philadelphia Museum often hosted public firsts including the Columbianum in 1795 (America’s first art society exhibit), the physiognotrace in 1802 (an instrument newly brought from England with which an operator traced a person’s profile and used it to cut paper silhouette portraits), and gas lighting in 1816 (the first in a Philadelphia public building). Despite the Philadelphia Museum’s innovations, Peale’s sons advised their father that the museum faced stiff competition from other places of amusement that had appeared in many American cities. Bound by the museum’s purpose to inform and educate, Peale vowed never to stoop to a level of low public entertainment. However, he had added both natural curiosities (like a five-legged calf) and sensational objects (like the trigger finger of a convicted murderer) to the museum’s exhibits. And, the Philadelphia Museum expanded to include branches in Baltimore (1814) and New York City (1825). Managed by Peale’s eldest sons, Rubens (1784-1865) and Rembrandt (1778-1860), respectively, these branch museums included the same kinds of exhibits although smaller in number. Always subject to financial crises and changing public tastes, the Philadelphia Museum struggled to maintain its prominence as the nineteenth century unfolded. Just after Peale’s death in 1827, the museum moved from the Pennsylvania State House one block west to the new and larger Chestnut Street Arcade. After two subsequent museum relocations, burdened by rising maintenance costs unmet by admission revenues, the Peale family sold the museum collection (except for the portraits) in 1849. The Philadelphia Museum collection’s buyers, Phineas T. Barnum (1810-91) and Moses Kimball (1809-95), had their own museums in Philadelphia, New York, and Boston. Within a short time, all of them experienced a series of fires and financial hardships that destroyed or dispersed their holdings. By the early twentieth century the former Philadelphia Museum’s vast natural history and ethnographic collection was known only by four bird specimens at Harvard’s Museum of Comparative Zoology and possibly (records are unclear) some American Indian and Oceanic artifacts at Harvard’s Peabody Museum of Archaeology and Ethnology. Karie Diethorn is the Chief Curator of Independence National Historical Park–the home of Independence Hall, the Liberty Bell, and nearly one hundred portraits from Peale’s Philadelphia Museum. Brigham, David R. Public Culture in the Early Republic: Peale’s Museum and Its Audience. Washington: Smithsonian Institution Press, 1995. Fanelli, Doris Devine and Karie Diethorn, eds. 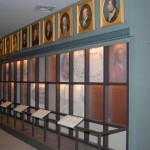 History of the Portrait Collection, Independence National Historical Park. 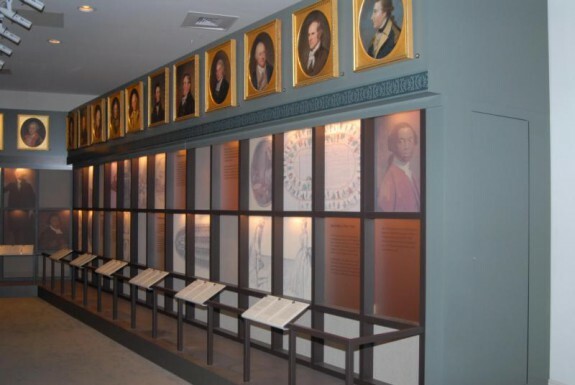 Philadelphia: American Philosophical Society, 2001. Miller, Lillian B., ed. 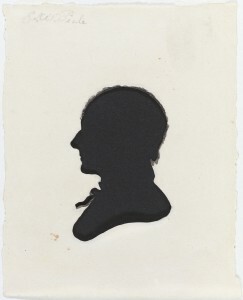 The Peale Family: Creation of a Legacy, 1770-1870. New York: Abbeville Press, 1996. Miller, Lillian B., ed. The Selected Papers of Charles Willson Peale and His Family, vols. 1-5. New Haven, Conn.: Yale University Press, 1983-2000. Sellers, Charles Coleman. 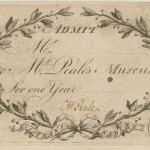 Mr. Peale’s Museum. New York: W.W. Norton & Company Inc., 1980. Ward, David C. Charles Willson Peale: Art and Selfhood in the Early Republic. Oakland: University of California Press, 2004. Peale Papers, American Philosophical Society, 104 S. Fifth Street, Philadelphia. Charles Willson Peale Historical Marker, Third and Lombard Streets, Philadelphia. Is there still an exhibit somewhere in Phila. that shows things from Mr.Peale’s museum? I remember visiting an exhibit decades ago and had a silhouette done with a physiognotrace? I work at Winterthur Museum now and would love to see the exhibit again. I have in my possession a pair of oval Cameo earnings and lady’s oblong cameo lapel pin. These were purchased by Mary Jane Peale during a trip to Italy in mid 1800s. Mary Jane Peale was Charles Wilson Peale niece programs niece. These items were given to me as payment for transcribing from the Mary Jane Peale’s diary. I had authenticated papers but lost them during several moves. I am very old now and have no need for the ratings and pin. And before putting them on E-Bay for sales, perhaps the Museum would like to own them. Other than the Peale Museum portraits, there isn’t much left from the Museum. There are some bird specimens at the Harvard Museum of Comparative Zoology, and the Peabody Essex Museum has some ethnographic specimens. Philadelphia’s Academy of Natural Sciences has a butterfly collection assembled by one of Peale’s sons. There are lots of Peale Museum silhouettes out there (Independence National Historical Park has a park ranger-led program that demonstrates on a replica physiognotrace)– so many, in fact, that one has to be careful of fakes. How interesting about the Mary Jane Peale cameo jewelry. Since the pieces aren’t related to Peale’s Museum, Independence National Historical Park couldn’t accept them for its collection. But, if you’d like to contact me regarding them, I have a suggestion of someone who might be interested.